After a shopping spree for natural resources, the Chinese are shifting to automakers, high-tech firms, and real estate. Where will they strike next? Employees of CMEC, the Chinese construction giant, are building a hydroelectric dam in the Congo. 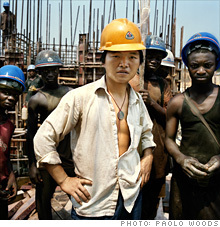 CMEC requires Chinese workers to wear yellow hardhats and the Congolese to wear blue. When China's $300 billion high-speed train system is completed, it will be the world's largest, fastest, and most technologically sophisticated. Photographer Benjamin Lowy captures the epic project and reveals its human side. (Fortune Magazine) -- You wouldn't think the men who run the oil-rich country of Nigeria would have much spring in their step these days. The nation is plagued by a never-ending guerrilla war, one that has trimmed the country's oil production to two-thirds of its potential capacity. But now Nigeria is in the process of renewing production licenses for some of its most prolific offshore fields, and there's a new player in town making the traditional oil powers from the West (Royal Dutch Shell (RDSA), Exxon Mobil (XOM, Fortune 500), Total (TOT)) very nervous -- and the Nigerian government very happy. CNOOC (CEO), one of China's three largest oil companies, is trying to pick off some of the licenses; indeed, the Beijing-based company wants to secure no less than one-sixth of the African nation's production. And CNOOC, apparently, isn't screwing around. Tanimu Yakubu, an economic adviser to the Nigerian President, recently told the Financial Times that the Chinese company is "really offering multiples of what the existing producers are pledging [for licenses]." Then he added giddily: "We love this kind of competition." Oil in Nigeria (and the Congo and Brazil and Kazakhstan and ...). Natural gas in Iran. Iron ore in Australia. China's hunt for natural resources around the globe, which began in earnest earlier this decade, has intensified as never before. In September alone, China's sovereign wealth fund, the China Investment Corp. (CIC), shelled out nearly $1 billion to buy an 11% stake in JSC KazMunaiGas Exploration Production, a Kazakhstan oil and gas company. Just a week earlier CIC paid $850 million to acquire 14.9% of Noble Group, the Hong Kong commodity-trading powerhouse. Earlier this summer the China Development Bank lent Petrobras, the Brazilian national oil company, $10 billion to help fund exploration in deep waters off Brazil. So far this decade China has spent an estimated $115 billion on foreign acquisitions. Now that the nation is sitting on massive foreign-exchange wealth ($2.1 trillion and counting), it is eager to find something (anything!) to invest in besides U.S. Treasury debt. In 2008, China's investments abroad doubled from $25 billion to $50 billion. Yes, China still lags the U.S., which, as the world's largest exporter of capital, invested $318 billion abroad last year. Yet in many ways, China has only begun. And it won't stop anytime soon. Though still focused mainly on the natural resources that power its economy, China is now, slowly but surely, broadening its foreign-investment horizons. Both the government and private firms are beginning to look beyond the developing world for assets. Already the Chinese have bought stakes in foreign banks, utilities, and semiconductor companies. This is a hugely consequential step, both for China and for the global economy. In the first decade of the 21st century, China established itself as the world's workshop. The next decade (if things go right) could see China emerge as the world's leading exporter of capital. As Daniel Rosen, the coauthor of a recent study on China's foreign investment and a principal at the Rhodium Group, a New York City consultancy, puts it, "Increasing foreign direct investment is the next critical step in China's integration into the global economy." How critical? China's recycling of the dollars it earns via its trade surpluses is a key part of the "rebalancing" of China's economy that everyone knows needs to occur. China saves too much, consumes too little, and has been overly reliant on exports to fuel its economic growth. The current binge of growth at home -- nearly 8% in the first half of 2009 -- has been driven by a huge upsurge in credit growth from state-owned banks, as well as massive government stimulus spending. Neither is sustainable, and indeed, policymakers in China have already begun to rein in the surge in bank lending. Make no mistake, the way Beijing has generated growth in 2009, however impressive it may look from afar, will prove to be an aberration. Once this period of crisis passes, China has no choice but to confront the necessity to drive up household incomes and private consumption. This macroeconomic adjustment will, among other things, require a stronger renminbi to boost the Chinese consumer's purchasing power. A more valuable currency will also make foreign assets cheaper for acquisitions, driving microeconomic decisions at the company level. The implications for Chinese companies are huge. Becoming the world's factory has pretty much taken China's economy as far as it can. As consultant Rosen puts it, "For a lot of Chinese companies, domestic economies of scale are now maxed out." China's corporate sector does not need to invest in and run factories that sell sneakers for Nike or toys for Mattel or auto parts for Magna. Chinese companies need to become Nike, Mattel, and Magna. They need, in consultant-speak, to move up the value chain. Another reason the Chinese are buying stakes in foreign companies -- or buying them outright -- is that so few domestic companies have experience operating in the U.S. or Europe. Everything -- from the regulatory and legal environments to auditing and consumer safety standards -- is alien to the Chinese. Arguably the most painless mode of entry for them is outright acquisition. That's what Chinese computer maker Lenovo did when it bought IBM's PC business in 2005 -- one of the few high-profile acquisitions of a U.S. business by a mainland company. Lenovo had a dominant position in PCs at home but little presence abroad. The acquisition changed that instantly. Lenovo has since worked hard to maintain the image of a global, as opposed to a Chinese, company. This process, which China has called its "going out" strategy, will not happen overnight. But make no mistake, it is gaining momentum. Take Geely, for example, an ambitious, privately owned automaker based in Hangzhou, a city just south of Shanghai. Its CEO, Gui Shengyue, said last month that the company was interested in buying Volvo's car business from Ford (F, Fortune 500). A deal may or may not happen (of late Volvo's management has been throwing cold water on the idea). But the interest shown by a credible Chinese company in wanting to buy a big, established brand abroad should not be ignored. It's a signpost to the future. A big part of that future will involve China investing in financial assets and real estate. Look only at the number of trips that the world's leading hedge fund managers have been making to Beijing this year. They go for the same reason Willie Sutton robbed banks, but they arrive at the headquarters of CIC as supplicants on bended knee, desperate for investable capital in the one place in the world where that is very much in surplus. CIC has $300 billion of the nation's money to invest, and it has now begun doling out dollops of it to a variety of Western investment managers because it has nowhere near the capacity to run that kind of money by itself. So in September it gave $1 billion to Oaktree Capital Management, the L.A. firm that specializes in buying distressed debt securities (an area that yielded huge returns in the past year). Analysts expect an additional $2 billion to go to Western hedge funds and money-management companies in the next few months -- and that represents only a sliver of CIC's forthcoming investments. J.P. Morgan & Co. in Hong Kong estimates that Beijing's sovereign wealth fund will invest $50 billion in the coming year. CIC officials have had recent discussions with several private equity managers -- including BlackRock (BLK, Fortune 500) and Lone Star -- about investing in U.S. real estate. "Mortgage-backed debt as well as outright purchases of buildings," says one banker with knowledge of the talks. "You name it, it's on the table." Investment advisers who have talked with CIC's top management have said that they are acutely aware of what one investment banker calls "the Japanese precedent." In the late '80s and early '90s Japanese companies splurged on trophy properties, including Rockefeller Center, and wildly overpaid for many of them. CIC itself, in one of its first investments, bought a 9.9% stake in the Blackstone Group (BX) just before the company's $31-a-share IPO -- and just before the market crashed. (Blackstone now trades at $13.60.) "They are being very careful and very disciplined in their approach to potential real estate investments," says one Western banker in talks with CIC. The Chinese have already learned from bitter experience that investment abroad is not always win-win. Far from it, in fact. Their first whiff of that reality came in 2005, when CNOOC tried to buy Unocal, the Los Angeles-based oil company, and was rebuffed. The effort triggered opposition in Washington -- some congressmen questioned the wisdom of letting a big American oil company get taken over by a partially state-owned company from a country that, while not an enemy of the U.S., is not an ally either. As China's state-owned companies increase their foreign investments, expect repeats of the Unocal case. Australia's foreign investment review board recently recommended that no foreign company be allowed more than a 15% stake in any of the country's natural resources companies. That decision, coming in the wake of China's state-owned aluminum company's failed effort to acquire nearly 20% of mining giant Rio Tinto (RTP), is aimed squarely at Beijing. At a time when trade tensions with Beijing are rising in the wake of President Obama's decision to slap tariffs on Chinese-made tires, the cry of the trade hawks is easy to anticipate: Chinese state-owned companies can buy our assets here, but can we turn around and buy a state-owned company in China? The answer is no, but that doesn't mean the U.S. should not take China's money. Washington needs to set clear guidelines for Chinese investment. Are all U.S.-based energy companies off-limits? Or only some? Or none? Says Rosen: "I expect China will play by the rules -- provided it knows what the rules are." Let's hope he's right. Because the Chinese have more dollars than they know what to do with, and economies benefit when both goods and capital flow freely across borders. The U.S. ought to set aside its current economic insecurity and answer a simple question correctly: If the Chinese want to park more of their money in American assets (besides Treasury bills), why wouldn't we open our pockets and take it?